We are one of the leading european specialists in storage and covering solutions in plastic sheeting. 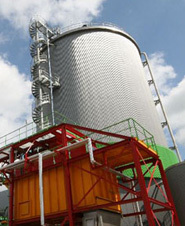 Our waste water treatment plants purify highly loaded waste waters flexible and efficient. Organic wastes, as generated in agriculture, food processing or palm oil and sugar industry contain an energetic potential we make useable with our waste processing biogas plants. Universal mobile shredders, two shaft double jaw breakers and staionary shredding solutions for waste wood, biomass, waste plastics, scrap metals and C&D debris. Eggersmann sets new standards in recycling with its specially developed plants, concepts and products. We offer mechanical and biological treatment solutions. One of the world’s leading suppliers of advanced combustion solutions, heat and power plants, and emission control systems. Welcome to SUMA, your provider for agitators and mixers, specifically designed for biogas plants and liquid manure tanks or lagoons. We offer our customers a complete range of cranes, hoist units, drives and handling technology for every application. We are designing recycling equipment and ready-to-use systems for various purposes. HAAS designs innovative machines and plants for the processing of waste wood and waste. TYRON is for example the ideal solution for shredding and volume reduction of e.g. waste wood, green waste, household waste, bulky waste or industrial waste. We plan, build and maintain with sustainability and quality in order to offer you highly economical biogas plants. We optimise the biological processes in biogas fermenters in every type of system, and with every type of substrate. 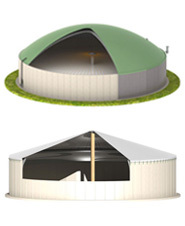 The company BioG Biogastechnik GmbH plans and manufactures mechanical components for biogas plants.